I've just ordered one for myself to keep warm this winter, the first product to mention is a hooded sweatshirt, also better known as a hoodie. I've gone for navy (which I've set as the default colour), but other colours are also available. Apart from the hood it also has front pockets helping to keep warm. The print, of course ‘I'd rather be on Islay’, is on the back this time. Other new products include a messenger bag and an umbrella. I'm not sure the umbrella would survive the Islay winter storms, but I should think it will be fine on the mainland. 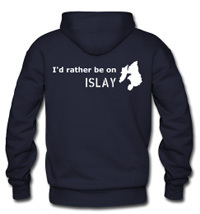 Of course the I'd rather be on Islay T-Shirt is also still available.